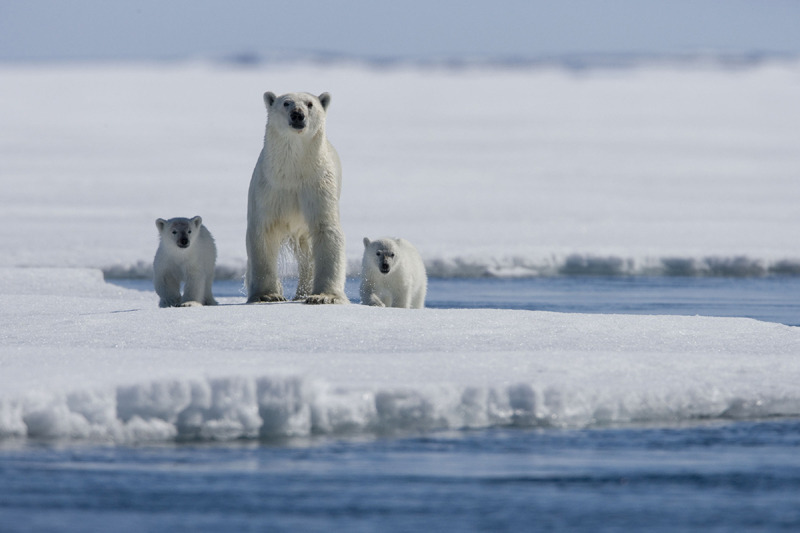 Polar Bears International– In 2008, the Intergovernmental Panel on Climate Change, the U.S. EPA, and the Arctic Climate Impact Assessment all reported sea ice loss in the Arctic equal to an area the size of Alaska, Texas, and the state of Washington combined. Effect on polar bears. Today’s polar bears are facing rapid loss of the sea ice where they hunt, breed, and, in some cases, den. Changes in their distribution or numbers affect the entire arctic ecosystem. Scientists believe that we still have time to save polar bears if we significantly reduce greenhouse emissions within the next few years. Yet it will take 30 to 40 years for changes reversing the warming trend to show. There’s some evidence that polar bears are leaving the sea ice to den on land even in winter. In Russia, many bears have been stranded on land by long summers that prevent the advance of the permanent ice pack. In the Western Hudson Bay area where permafrost has declined, denning areas are vulnerable to forest fires in the summer. Warm spring weather leads to increased rainfall causing dens to collapse. Without ice, polar bears are unable to reach their prey. Shorter hunting seasons correlate directly with a 22% drop in the population of Western Hudson Bay near Churchill in Manitoba, Canada since the early 1980s. A Southern Beaufort Sea population study shows a drop in cub survival rates, as well as declines in the weight and skull size of adult males, when compared with data from 20 years ago. Similar declines were observed in the Western Hudson Bay population before it dropped. Polar bears are finding too much open water. In 2004, four polar bears drowned off the coast of Alaska when trying to swim to the pack ice.